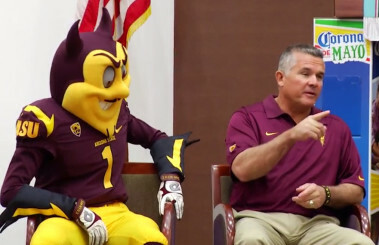 In a move certain to offend all college football fans who haven’t been advised to sell when their IQs reach 50, Athlon Sports’ Steven Lassan labeled ASU’s Todd Graham (77-41) the best head football coach in the Pac-12. If that wasn’t gray matter-challenged enough, he relegated Oregon’s Mark Helfrich to the bottom half. It’s time for Lassan to drop back 15 yards and punt, because his ill-founded conclusions are the subject of this week’s Three-and-Out. 1. Let’s get serious. Lassan places high emphasis on winning at places where it’s hard to win, and he also gives points for having coached here and there rather than just one place. So, if one of the top football powerhouses — such as Oregon — thinks a coach is worth hiring, that works against him, according to Lassan’s twisted logic. And if you’re a better coach because you’ve served at multiple universities — rather than just one — then Elizabeth Taylor must have been a great wife, because she had eight husbands. It wasn’t nice, but clearly the devil made him do it. An unfair comparison? I don’t think so. Lassan cited Graham’s stint at Pitt as one of the things that has contributed to his greatness. But let’s revisit history. Graham cited Pitt as his dream job, pledged loyalty and at the end of his first regular season (2011) criticized assistant coaches who left to join Rich Rodgriguez at Arizona as being mercenaries. Two weeks later, Graham resigned to take the ASU job and notified his players of his departure via text message forwarded through Pitt’s Director of Football Operations. His departure came on the heels of a 6-6 regular season in which Pitt actually beat two teams with winning records (7-6 Louisville and FCS-sized Maine). He left the program in such a state of disarray that it finished its season with a 28-6 loss to SMU in the BBVA Compass Bowl. This was six years and three schools into his head coaching career. Despite Graham’s having had a couple of decent years at ASU, this is hardly the best that the Pac-12 has to offer in the way of head coaches. Lassan lists five other coaches he thinks are better than Helfrich. He picks Arizona’s Rodriguez as the second-best coach, despite the ho-hum record (146-98-2) and even though Rich Rod’s last two games were a 51-13 loss to Oregon in a game that was nowhere near as close as the final score would indicate, and a stink-’em-up loss to Boise State in the Fiesta Bowl. Stanford’s David Shaw was a good choice for a high pick at No. 3, but Chris Petersen (at No. 4) has proven nothing other than that he can win at Boise State. So did Dirk Koetter and Dan Hawkins. And placing Utah’s Kyle Wittingham and the Beavers’ Gary Andersen (who has yet to coach a single Pac-12 game) ahead of the guy who just took his team to the National Championship game in his second season as a head coach is … how can I say it nicely? … Sorry, I can’t. It’s stupid. 2. Phil Knight is smarter than you. Yes, it’s nice to have a bit better than moderate success with a program that tends to underperform, but what Lassan is missing is the fact that the best coaches get the best jobs. It’s the way the world works. And Oregon and Stanford are two of the best jobs. They are the only two programs that have, so far, won Pac-12 football championships. They are also the only two schools in the Pac-12 from which Phil Knight has degrees. But maybe that’s just a coincidence. 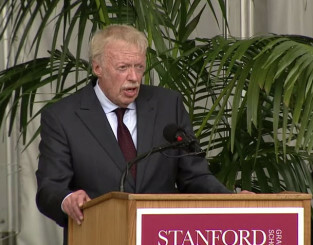 Phil Knight delivers commencement address to Stanford School of Business. One thing you can take to the bank, though, is that Phil Knight probably said “yes” to the Helfrich hire. And if you don’t think Knight is smarter than Steven Lassan, I can give you about 23.3 billion reasons that he is. Knight has invested hundreds of millions of dollars in seeing that Oregon has a strong athletic program, and in case you haven’t noticed, Phil Knight is not prone toward making poor decisions with his money. And a lot of that involves knowing who to hire. 3. Helfrich has done it all. Lassan points out that coaches at well-endowed programs may be just better CEO’s than coaches and seems to believe that if you’re starting from scratch, you want the guy with the game plan and the X’s and O’s — the guy who can recruit — because, after all, we’re focusing on the coach, not his assistants, facilities, etc. And we have to assume that the assistants aren’t part of the deal. CEO mentality not required here. Wrong again. 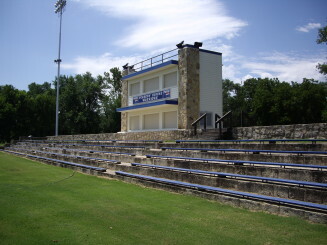 Unless you’re in some one-horse backwoods 8-man high school program, you want the guy who can build and maintain an organization. Not that there’s a coach in Lassan’s top half who has proven himself better than Helfrich at game planning, recruiting or X’s and O’s, but Helfrich has proven his leadership at the highest level of college ball. 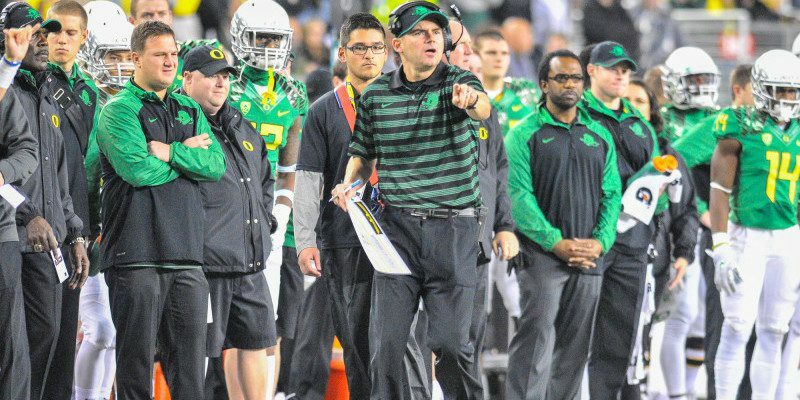 When Chip Kelly bolted for the NFL shortly before National LOI Day in 2013, Helfrich held Oregon’s recruiting class together. He also held Oregon’s great staff of assistant coaches together. And in 2014 when Helfrich could have blamed a mid-season loss on injuries, he shouldered the blame — a sharp contrast to the, “Please text the players that I’m splitting” routine that Graham pulled at Pitt. Kelly was a tough act to follow. Historically, when coaches follow tough acts, more often than not they fall flat on their faces. Helfrich did not. He took what Chip left behind and built upon it by winning 24 games in his first two years on the job — not an easy task. Mark Helfrich in the bottom half of the Pac-12 coaches? Four months after taking his team to the National Championship Game? Five months after having the quarterback he coached win the Heisman? Get real. He’s the best head coach in the Pac-12.